Bearish Reversal Patterns - One of the most significant goals of technical analysis is to identify changes in direction of price action. 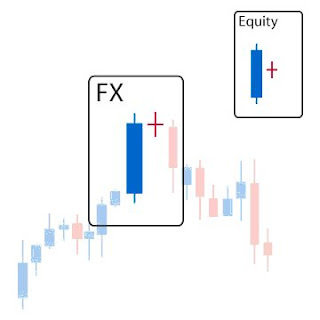 Because candlesticks give visual insight into what the market is market psychology, one of the most useful aspects of candlestick analysis is its ability to suggest changes in the sentiment of the market, and reversals in trend. 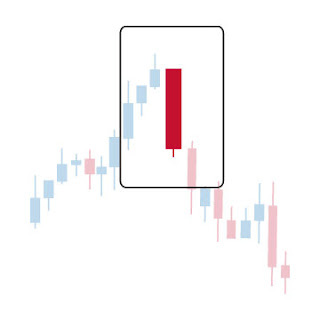 We call these candle formations Reversal Patterns. 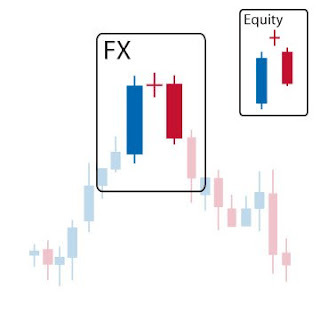 Important to note is that with candlesticks a reversal pattern does not necessarily suggest a complete reversal in trend, but merely a change or pause in direction. That could mean anything from a slowdown in trend, sideways trading after an established trend, or a full turnaround following a reversal candle pattern. During an uptrend a large upward price movement occurs, illustrated by a long blue candlestick. The price is then driven down, as shown by a red candlestick, reversing some of the upward movement from the previous day. The reversal pattern is confirmed with the third days red candle completes the bearish pattern. This pattern is a confirmation of the Harami pattern. Evening Stars start with a continuation of the bullish move. The second day sees a continuation of the move up, but a sell-off makes the market close at or near the open for the day. The first two candles meekly suggest a loss of bullish momentum. In fact up to day two this formation matches the Bearish Shooting Star weak-to-moderate strength reversal pattern. Although the example above is a blue shooting star, the shooting star can really be any color. Bearish Shooting Stars alone are decent signals for additional sell-offs on day three. Since the certainty for a shooting star indicator is low, the trend reversal should be confirmed by a red candlestick the next day. Thus Bearish Evening Stars require on day three a sharp sell-off after the market open. Analysts want day threes high to be near equal to its open price, suggesting the market sell-off has no uncertainty in the new direction. With this pattern watch for sells offs the follow days. In non-FX markets gaps are quite common, and Evening Stars traditionally require a gap between the first and second day. In fact the wider the gap from day two to three the better the signal in non-FX markets, since the higher day-two goes the stronger day-threes bearish move is. Because FX offers 24 hour trading, no gaps should be expected. The Forex Market version of this formation would share the same market close price on day one, and then start day twos rally from there. Day twos close would be the same whether in FX or any other market restricted to fixed exchange hours. The formation would tend to see a shooting start on day two. Thus this formation might more aptly be called Evening Shooting Stay when applied to the Foreign Exchange Market. The market continues the uptrend on the first day. By day two sellers take price down to close near the open of the previous day. 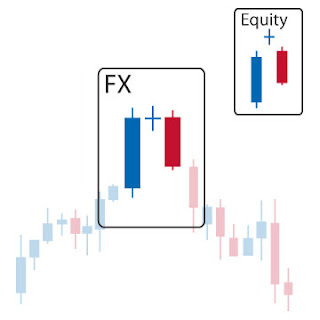 In FX, traders view the higher the second day high the better since the bigger the rally after the open, the more sellers were able to drive price back down. This formation suggests short sellers have begun to take charge of the market, and longs have been shaken by the sudden lost of bullish momentum. Declining days are common after this formation as more short sellers confidently to enter the market with a clear stop benchmark at the second day high. The deeper day-two closes into the first day candlestick body, the greater the chance of the uptrend topping out. If the second day candle does not trade below the midpoint of the first day body, traders typically feel it safer to wait for confirmation on the third day. Some traders wait for confirmation regardless of how deep the Dark Cloud Cover penetrates the second day. In non-FX markets, traders want to see the second day gap up, opening above the close of the previous day. Because the Forex Market offers continues 24 hour markets, such gaps are not typically possible. But FX traders will turn to the high of the second day to indicate how strong the opening rally is, to gauge the strength of the subsequent bear move. • Day-one is a blue day. • Day-two is a doji or small candle. • Day-three is a large red day. The Abandoned Baby is a rare bearish reversal pattern characterized by a large move up followed by a doji or small candle, and then a third candle heading in the opposite direction. The formation reflects a classic three period reversal of market sentiment where after a bullish trend; enough sellers enter the market to take control. They first stop the trends momentum (doji), and then ultimately reverse the direction of the market. This first bullish move suggests a continuation of the bull market. That move is followed by a doji, where markets trade in a small range suggesting uncertainty in trend and sell off potential. Up to day two we actually have a Doji Star, moderate strength bearish pattern. After the day of indecision, a large bearish candle confirms the sell-off and reversal. The stronger the move down day-three, the stronger the reversal signal. Watch for additional bearish price action in the next few days. 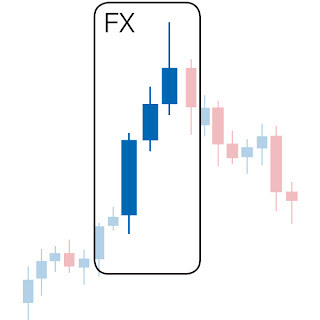 In Foreign Exchange this pattern is near identical to the Bearish Evening doji Star pattern. Outside of the FX Market Abandoned Babies require gaps between the close and open prices of subsequent candles and shadows. In fact the name Abandoned Baby suggests the doji baby candle is disconnected from the rest of the formation. This is possible because gaping is common in other less efficient markets where trading is restrained by business hours. Since the currency market offers 24 hour trading, gaping is rare and is only seen to a minor degree after weekends. In a market characterized by uptrend, day-twos red candle close completely below day-one, engulfing it completely. The first two days are a classic pattern that suggests a sell-off has taken over the market and is breaking the established trend. This bearish reversal is confirmed by a still lower day on day-three. 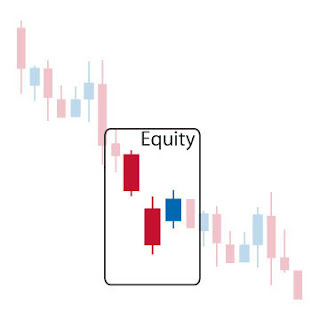 • Connections to Bearish Engulfing PatternThe Bearish Three Outside Down pattern is just a continuation for Bearish Engulfing with the third day as confirmation for trend reversal. 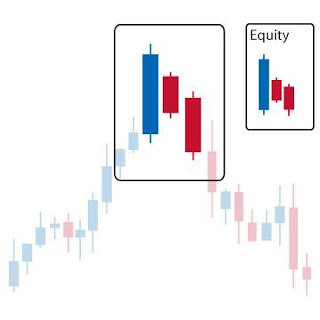 A Bearish Engulfing pattern by itself is a moderately reliable reversal signal, but when it is followed by a red day (forming the Bearish Three Outside Down), the pattern becomes much more reliable. After an uptrend, three consecutive blue days close higher everyday. Three blue days in a row typically reflect the very definition of a bullish trend. But with the Advance Line each successive bull candle is weaker than the preceding day. Often the second and third days will have longer upper wicks, indicative the market striving for higher, unsustainable highs; a hallmark of a weakening uptrend. Taken as a whole this scenario suggests that the previous upward rally is losing steam and preparing for a reversal. Long position holders need to be careful when the bull candle bodies are progressively getting smaller or showing relatively long upper wick. They may want to consider protecting their positions from future price weakening. The Bearish Advance Block Pattern is not normally a strong reversal pattern, but it can potentially predict a price decline. This pattern's signal is stronger when a previous uptrend has pushed prices to new highs. The pattern suggests that buy positions liquidate their positions, though it is not yet clear that an opportunity to short exists. A fourth day reversal (red candle) would act as confirmation for short traders who are looking to enter the market. In non-FX Markets each new candle will open within the previous candle's body and close near the high of the previous day. 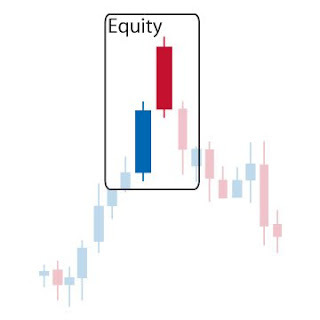 • In an upward trend two long blue days occur • The third day is a shorter blue candle, such as a spinning top or doji. The Deliberation, or Stalled Pattern shows a weakening upward trend. After two strong blue days the small body of the third day indicates that the movement is losing momentum. While the pattern predicts a reversal, it is usually not strong enough to create a sell signal; rather it should be used as an indication to liquidate long positions. Furthermore, this pattern is most significant after long rallies. 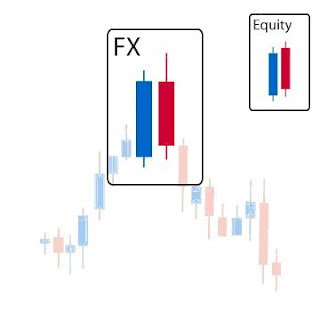 • Bearish Deliberation Patterns Not Possible in FX Markets.Deliberation patters require the second day candle to open within the first days candles body. Such a gap in open price of course is not possible in the more efficient 24 hour FX markets. 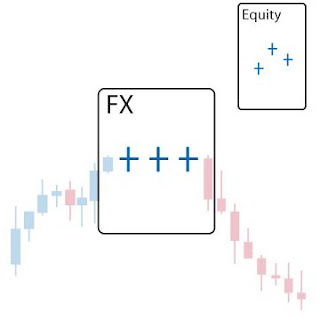 FX Traders will tend to look similar looking bearish Advance Block and bearish Breakaway patterns to suggest the same market psychology and trade signals. After a market in an overall uptrend the sharp sell-off reflected by the Dragonfly suggests the bulls may have lost sway over the market trend. Despite the fact that market price closes at or near its open/high price reflecting a bull rally in the same day, this candle casts doubt on the markets ability to continue the uptrend. With bulls losing momentum the pattern can potentially be a signal for further sell offs. Watch for confirmation of the reversal should markets trade bearish the next day. 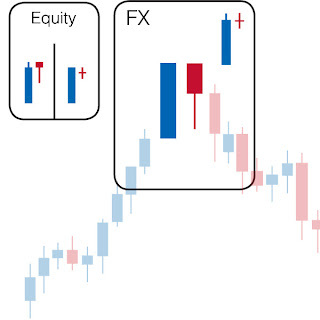 Dragonfly Doji vs Hanging Man The Bearish Dragonfly Doji Pattern is a rare single candlestick pattern that occurs at the top of an uptrend. It is very similar to the Hanging Man Pattern, except on a Dragonfly Doji the opening and closing prices are nearly identical (no body). When markets manage to close at the same price as they open it suggests more uncertainty about future trend than even a small candle. That makes the Bearish Dragonfly Doji more reliable than a Hanging Man offering a stronger bearish signal. • In an established uptrend, an average to small sized blue candle occurs on day-one. •Ideally with a red candles high is above the previous days high. 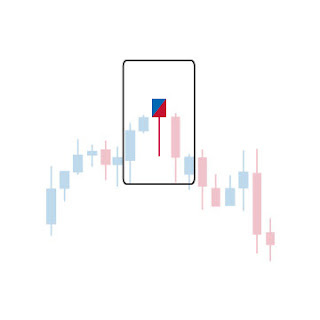 • The strength of the signal is additionally increased by the further the red candle closes below the low of the blue day.The Bearish Engulfing is one of the more clear-cut two day bearish reversal patterns. The formation reflects sellers overtaking buying strength, and often precedes a fall in price. • Day-One Characteristics for Signal StrengthThe first day may even appear as a Doji, and the smaller day-one is and larger the second day is, the stronger the reversal signal. Dojis and small candles reflect uncertainty in the markets trend, thus the smaller the first days candle the better the signal of an end to the established bull trend. • Day-Two Characteristics for Signal StrengthThe second day bear move acts to confirm the death to the bull trend. The bigger the red candle reflects the deeper the bear move and the better the reversal signal. • Overall Characteristics for Signal StrengthThis pattern is also more meaningful if it follows a lengthy bull trend, or a recent fast move up. Both these cases suggest the market may be overbought and more apt for a reversal. 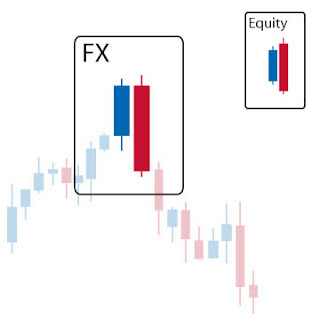 Bearish Engulfing patterns also provide resistance levels for where the highest level of price action reached. In the future this level may be difficult to break. • The market should be characterized by an uptrend. • Both days close at the same priceAfter an uptrend, the second days candle open above the previous close. Even though the second day had rallied during off-exchange hours and opened high, a sell-off brings the close near the previous day closed. Figuratively meeting the lines of close prices. This typically means the bull trend has been weakened and a reversal is possible. • Psychology and ConfirmationIn many ways this is a typical clear-cut bearish reversal pattern. The market has been trading up for sometime. We see a big bull rally on day-one setting benchmarks for the current rally. Then between when the exchange closes on day-one and when doors reopen on the exchange day-two, the market has continued to drive price up. Day two sees a sell-off signaling a reversal in trend. Longs would be looking to par off their positions and candlestick analysts will be watching for short opportunities. But like most moderate strength reversals, traders like to see confirmation the next day. This formation may be fairly typical in a range bound market; Meeting Line is most significant after a protracted bull trend. Meeting Lines less reliable than Dark Cloud Cover The bearish Meeting Lines pattern is similar to the Dark Cloud Cover pattern. With Dark Cloud Cover patterns, the off-exchange rally it not nearly as high, suggesting weaker buying strength. The move down with Dark Cloud Covers is far deeper, suggesting sellers in the patter have more strength than with this pattern. Thus Dark Cloud Covers are more reliable. Meeting Lines Translated Into FX As illustrated above, the bearish Meeting Line is not possible in FX markets. Because the Forex Market offers 24 hour trading, gaps seen between day-one and day-two are not really possible. But clearly the same price action is possible, in FX the open price on day-two would match days ones close. 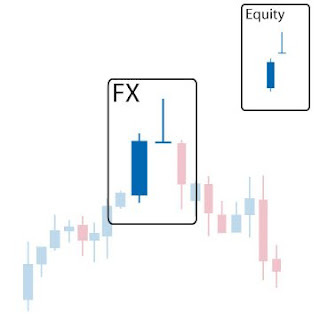 Thus instead of seeing a large red candle on day two FX traders following the same price action would see a Gravestone Doji, moderate strength reversal. After a long up-trending market the appearance of three dojis suggests a great deal of indecision about the future direction of the market. Such signs of indecision often precede reversals. The first doji day reveals that the market is indecisive after a long uptrend. The second doji day further emphasizes market uncertainty, by the third doji day longs have clearly lost momentum and complete control of the market. Candlestick analysts will look for bearish moves in the following days. The Bearish Tri Star pattern is very rare, but when it occurs it has significant top reversal pattern. A fourth day confirmation in the form of a large red candlestick is recommended to show that the actual uptrend has reversed. In non-FX markets traders may see this formation with a number of gaps between dojis (illustrated above). Because of the 24 hour nature of the Forex Market such gaps are unlikely. That makes the Tri Stars far less common in FX trading. Analyst will probably see Spinning Tops, (wider wicks with bigger high/low ranges, but same open/close) more prevalent. • The second, third and forth days all continue in the same direction with higher closes, but more weakly than the first bullish push. • The fifth day is a long red day that closes into the body of the first or second days. The first few candles suggest the strength of trend has accelerated significantly. By the third and forth days weaker moves up suggest the trend has started to slow. In fact the first three or four days matches the Bearish Advance Block formation. The Advance Block Pattern is not normally a strong reversal pattern and traders usually wait for additional confirmation the next day. The last candle of the Bearish Breakaway offers exactly that confirmation. After the few days of deteriorating bullish trend, a clear bearish candle emerges to reorient the markets direction. Markets typically want to see the bearish candle move below the previous two or three days deterioration for ideal confirmation. 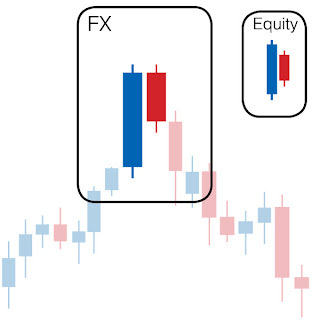 Candlestick analysts in non-FX markets typically require Breakaways to have gaps after the first big bullish move. Variations in gaps suggest changing strength of Breakaways. Due to the nature of the more efficient, 24 hour currency market, traders will not see such gaps. • The second day can be a doji day (identical open and close). The upper wick of the second day should be fairly long. • The lower wick of the second day should be non-existent or very little. In a bullish trending market the gravestone illustrates an unsustainable bull rally where price drives up to new highs in trading on day two, but sellers take control by market close. Although this formation is a moderate to weak in signal strength, it is a warning for longs that the uptrend is losing momentum and bears may retake the market soon. Most candlestick analysts will wait to confirm the signal, watching for a red candle for day three. Such confirmation could come in the form of the consistent bearish Evening Star pattern. The Gravestone Doji pattern is similar to the Doji star, except its second day is characterized by a gravestone (doji with a high high and low equal to open and close prices) rather than just a doji. The Gravestone Doji is less reliable since the rally on day-two suggests bulls may still be in control of the market, despite the recent sell-off. Where the Doji Star offers a stronger signal of uncertainty of possible reversal in trend. 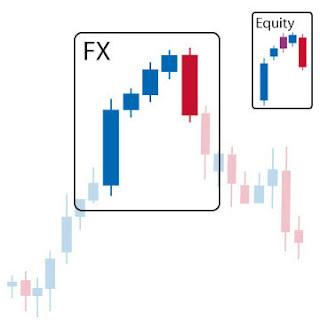 In non-FX markets traders accept a gap between day one and day two (a seen in the equity example above). Since such gaps are unlikely in the 24 hour Forex Market, when this pattern is translated into FX the gravestone could also appear like a shooting star and still be of the same signal strength. 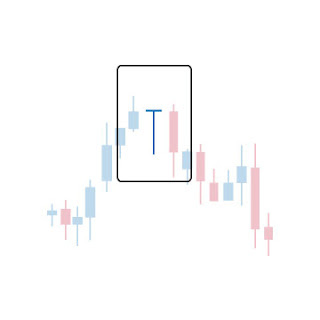 Regarding strength of signal, the more day-twos candle looks like a Doji the more it reflects sellers taking control of the bull rally, and the stronger the bearish signal. The Hanging Man formation indicates trend exhaustion, and suggests a bearish reversal. After a bullish rally the day opens with a significant sell-off, creating a long bottom wick. However, buyers are able to push prices back to the upper range, creating a short body. The meaning of the candle is a bit ambiguous. Even though sellers brought the market to low lows, in the end buyers brought the close price back up near the market open price. Overall this candlestick serves as an early indication that buyers are losing control and bearish traders are gaining strength. Since the signal alone is fairly weak, traders look for a number of characteristics to reinforce the bearish signal. In ideal conditions traders want the wick length to be several times longer than the body of the candle. The longer the candle, the stronger sellers were able to drive price down and the stronger the bearish signal this candle provides. 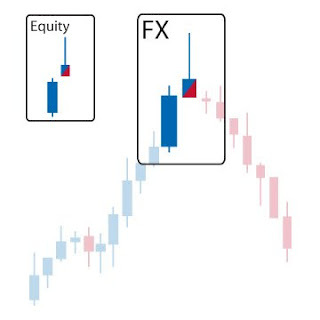 Although above we state that most analysts do not care if the small candle is red or blue, traders will actually take a red candle to suggest a slightly stronger bearish signal. Sellers being unable to bring the close price below the open price suggest stronger bearish control. The bearish Dragonfly Doji serves as a stronger sell signal than the Hanging Man pattern. 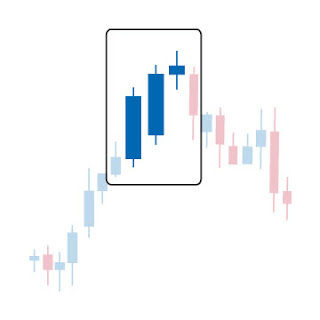 Since a Dragonfly candle (where open and close are identical, but we see a low similar in length to the Hanging Man) reflects more uncertainly and lack of direction, candlestick analysts will usually take it as a stronger bear signal. • Hammer vs Hanging Man.Alone, Hammer and Hanging Man candles look identical. Their difference lies in what type of trend the candle follows. If the market had been trending up for a while the formation is a Hanging Man. In fact the name, Hanging Man, suggest price is hanging over a precipice, ready for a fall. Hammers follow a bearish trending market and its name suggests price has already been weighted down. Although traders will usually wait for confirmation the next day, look for selling opportunities to come. • The red candle has an open price that is very close to the high of the day. Little or no upper wick.After a stretch of bullish candlesticks, a strong bearish candle forms. The bearish candle opens at the days high and closes significantly lower. The result is a long red candlestick with a short lower wick or no wick at all. This may signify a bearish trend ahead. The formation occurs frequently but is often incorrect in predicting future trend. To a degree the significance of the formation is fairly obvious; an uptrend is broken by a strong days move. Thus the larger the red candle, the stronger the likelihood of reversal. Traders will typically wait for further confirmation. 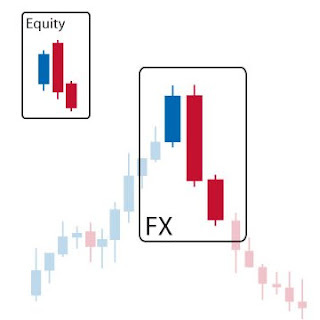 The non-FX market formation requires a large gap not possible in more efficient foreign exchange markets. Thus many argue that Bearish Belt Holds are simply not possible in FX, and the watered down Foreign Exchange version above should be overlooked for other more significant indicators. • First day is long blue candle continuing an established uptrend. • Day-two is a small candle or start whose range is within the first days body, above its midpoint. Bearish Haramis are characterized by a long blue day followed by a small candle, also refers to as a star. The trading range of the star stays within the body of the previous days candle. The significance of this formation is quite clear, as price continues its uptrend it is halted by a bearish candle. Bearish Haramis are very weak in signal strength though, since even in a strong bull trend it is very reasonable to see a sell-off that pulls price back down from highs. Longs paring off their exposure may cause this. Thus candlestick analysts will watch for bearish days to come, but probably not bet on them. In non-FX markets gaps seen above that allow the star to occur deep within the body of the first days candle are typical. Such gaps are just not possible in Foreign Exchange Markets. Since the Forex Market version of this candle is more nuanced, traders pay attention to several details. This formation is very similar to the Bearhish Engulfing formation, except that the Harami move does not trade below the previous candles body. Because Harami sellers are not able to drive price much past the previous days midpoint, this patterns offers a weaker signal. In range bound markets this formation will occur frequently with little significance. But if this pattern occurs after a protracted uptrend, analysts will attach greater importance to it. Lastly if this does turn out to be a reversal pattern the high of the two candles will likely turn into a significant resistance level. • In an uptrend, the first day is a long blue candle continuing the established bull trend. • The second day is a candle (red or blue) with a real body at the lower end, a long upper wick and no (or almost no) lower wick. Occurring in an uptrend the Shooting Star formation is indicative of a bearish change of momentum. Shooting Stars show that traders have tested the highs and settle the day near the open and low price. This suggests the rally is unsustainable and sellers are retaking the market. Although this pattern is fairly weak, for those traders with existing longs in the market the Bearish Shooting Star serves as a signal for the deteriorating strength of their position. 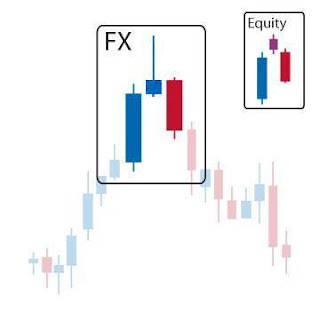 • ConfirmationMany traders will wait for a bearish move on the third day, forming a formation similar to the Evening Star three-candle pattern. If day three is a long red candle, that pattern combined with the shooting star is a very strong reversal signal. • First day is long blue candle continuing an established trend. • Day-two is a small candle completely within the range of the first day's body. • In an established uptrend day-one is a blue candle with a shaven bottom. • The second day is a red hammer or doji with a long lower shadow. The essential element of this pattern a series of candles that all share the same high. This could be the two days in the examples above, or a number of days that are non-consecutive. After a protracted bullish move this may provide a weak reversal signal, but most traders will look for additional confirmation of a reversal. More useful is how this pattern creates an important resistance level. In any market, trending or ranging, this pattern establishes a level of resistance. Resistance Levels are simply price ranges that markets have trouble breaking above. Thus the high price these candles all share creates a clear benchmark for the market to break.